Conclusion of the Haunting Joy Blog Tour! Happy Halloween! What better way to kick off the day than announcing some winners, wrapping up the tour, and inviting you all to join us for a Twitter chat? But first, if you haven't yet read Haunting Joy, this is the perfect day to pick up a copy! The spooky black & white paperback version is available at Amazon, and the e-book with the pink & purple cover (currently only $.99!) is available at Amazon, Barnes & Noble, iTunes, and Kobo. This sweet and meaningful little story is the perfect Halloween treat! 1. 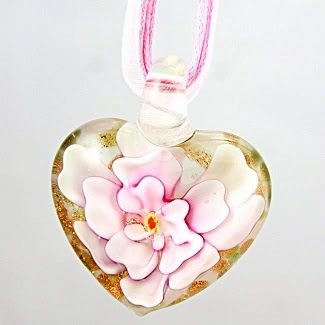 The winner of the glass heart necklace is Bailee! 2. 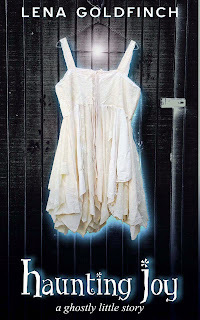 The winner of a signed paperback copy of Haunting Joy is Cynthia Clubbs! 3. 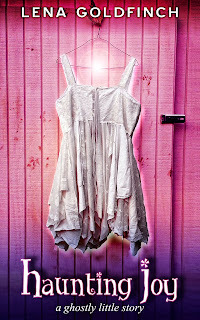 The winner of an e-book copy of Haunting Joy is Shelby Mead! Congratulations, winners! I've sent you an e-mail, and you have until Monday (Nov. 4th) to respond before I pick another winner. Thank you to everyone who participated in the spooktacular giveaway! Lena and I are grateful to the following bloggers for their participation in the blog tour. The tour couldn't have happened without them! We appreciate their time, creativity, and enthusiasm. Also, I'll let you in on a fun little secret... 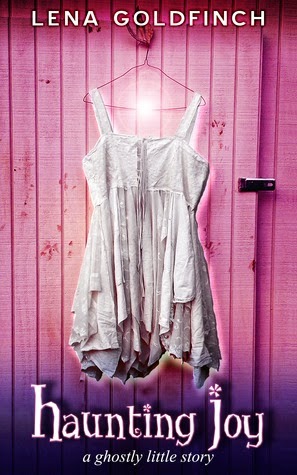 The cover for the next book in Lena's "Haunting" series (Haunting Melody) is up on her website! Besides chatting with us on Twitter (*wink*), what are your plans for Halloween? Hope you have a good (and safe) one! The Haunting Joy blog tour concludes tomorrow! There have been a lot of great stops along the way - including a review from a "ghost" (too fun!). To catch up on all the posts, find links to purchase the book, and enter the tour-wide giveaway (which ends tonight! ), visit the blog tour page. Also, don't forget that there's a Twitter chat tomorrow at noon EST/9 a.m. PST! It's the first chat Lena and I have hosted, so we'd love to see you there. (We'll even throw in some virtual M&Ms!) You can direct your questions regarding the book, the paranormal genre, Halloween memories, etc., to @lena_goldfinch, and include the hashtag #HauntingJoy. 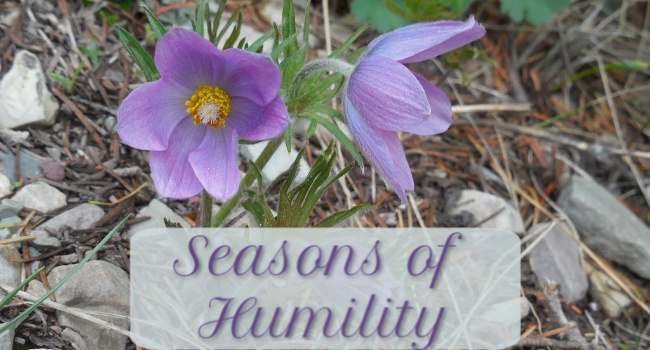 I'll be moderating via @SeasonsHumility. 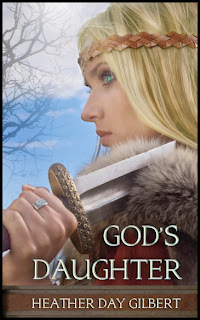 Fellow self-pubbed author Heather Day Gilbert's Viking debut officially releases this Friday (November 1st)! Visit her website to learn more. Sounds epic! And isn't the cover stunning? The Kindle Matchbook program commenced yesterday! I enrolled Bleeding Heart. What that means for you is that if you bought (or buy) the paperback version, you can get the Kindle version for FREE, so you can read the book on whichever platform you feel like, whenever you feel like it. Pretty sweet, right? At least, I think so! Let me know what your thoughts are on the program. If you're an author, did you or your publisher enroll your book? If you're a reader, will you be taking advantage of this offer? And finally, one last thing on Bleeding Heart - the book is currently only $.99 for Kindle! I'd love any help in spreading the word! Well, now that I've dumped all that info on you...have a fabulously bookish day! And be sure to stop by again tomorrow for the conclusion to the Haunting Joy blog tour. Lisa T. Bergren’s popular Grand Tour series concludes as Cora Kensington journeys farther into Italy, wrestles with a terrible ultimatum from her father, and comes to terms with the Father who will never fail her. The conclusion to the "Grand Tour" series promised to be full of drama - and that promise did not go unfulfilled! From health issues to job woes...from travel dangers to numerous threats to the heart...Glittering Promises is engaging and, overall, satisfying. This third leg of the journey finds Cora and her group in Italy, spending a lot of time in the countryside, away from the press and those who wish to exploit them. I confess that, while I enjoyed the descriptions of Italy, I did miss the broader variety of adventures and traveling descriptions found in the previous two books. But there were still plenty of twists in this book to keep me interested. The honest struggles of the characters endeared me to them, especially those of Cora, Will, and Vivian. There are some tough choices to be made, and a lot of startling and saddening happenings and revelations. This is certainly an interesting ending to their tour, let me tell you! Glittering Promises concludes this series full of romance, glimpses into the past, and tough questions. I loved the insights and new perspectives Cora gained, and I loved the tender moments. And might I add that Cora's big brother is wonderful? (Go Felix!) If you like historical romance, don't miss the Grand Tour! Lisa T. Bergren is the award-winning author of over thirty-five books, with more than 2 million copies sold. A former publishing executive, Lisa now divides her time between writing, editing, parenting three children with her husband, Tim, and dreaming of her next trip to Italy. She lives in Colorado Springs. 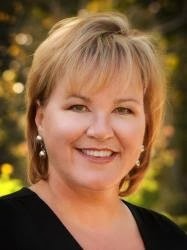 Find out more about Lisa Tawn at www.lisatawnbergren.com. 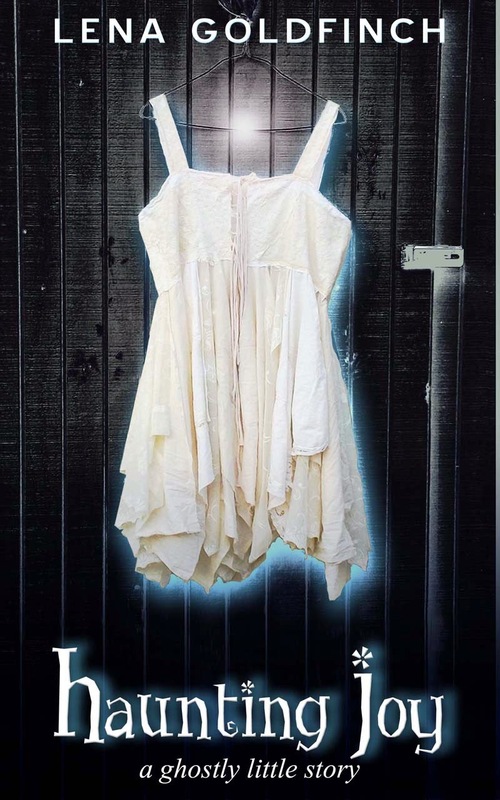 Launch of the Haunting Joy Blog Tour! 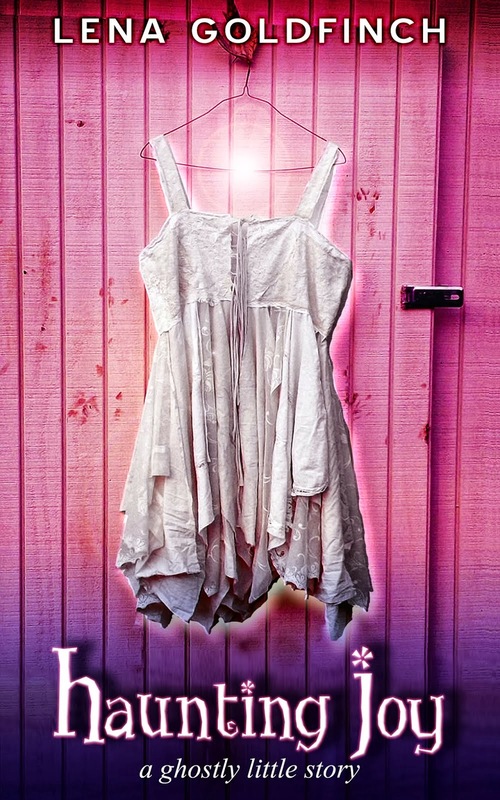 Lena Goldfinch - cover designer and author extraordinaire - has released a ghostly novella just in time for Halloween! I had the pleasure of copyediting Haunting Joy, and I loved it. It's sweet, a little spooky, and yet serious in its message about identity and empathy. A wonderful autumn read that I'm happy to be sharing about by hosting this blog tour! Introduction to the tour at Seasons of Humility ←You are here! For blog buttons, info about the author, links to purchase the book, and more book news, be sure to check out the blog tour page! We'd love to hear what your favorite Halloween treats are - be they of the candy variety, special memories, fun paranormal reads, or other seasonal favorites! I'll name one paranormal book I read recently and enjoyed: Paranormalcy by Kiersten White. I got it back when there was a $1.99 special for the Kindle book, and I found it to be an intriguing, funny, creative, and endearing read. If you don't mind the vampires and faeries and whatnot, it's fun! Please share some Halloween favorites and check out Lena's latest - and e-mail me at amberstokes@editingthroughtheseasons.com if you have any questions about the tour! 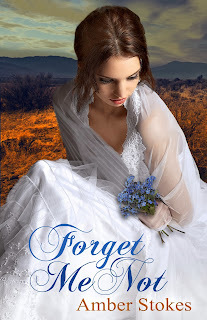 The first winner I want to announce today is the winner of the Forget Me Not cover reveal giveaway! ...won the forget-me-not note cards (from Carol Sapp Watercolors)! Congratulations, Nancy! You've been sent an e-mail, and you have until Friday to respond before I pick another winner. And now, for the second "winner" of the day - a contemporary romance novel that made a great impression on me! 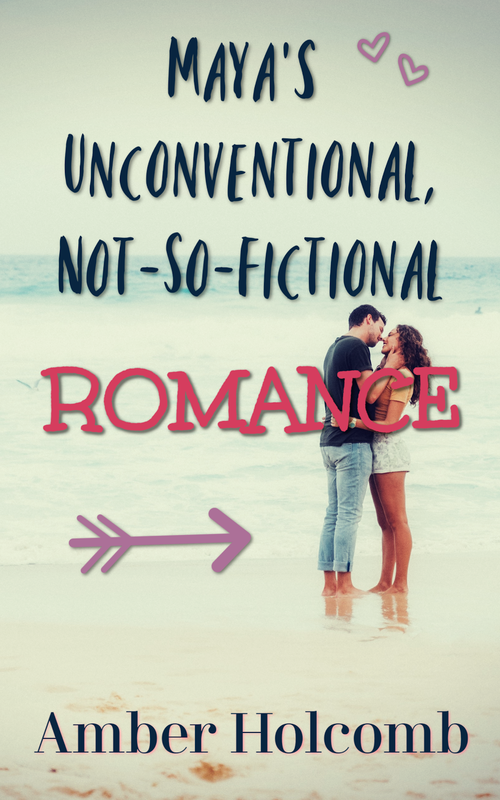 While historical romance may be the subgenre I gravitate toward within Christian romance, every now and then a contemporary romance will come along and impress me. Made to Last is full of great plot twists, wonderful characterization, and sweet and funny moments. While it may not be set in the past, the "foreign" and "formal" situations (the world of TV stars and big-name reporters) still swept me away to another place, and I enjoyed the excursion very much. One big conflict propels the story along, but constant added conflicts or new twists on the effects of the big secret keep the story moving along at a nice pace. I loved the contrast between Miranda's mountain home (and other country situations) and the craziness of being behind the camera, featured on a widely read celebrity blog, etc. And Tagg did a marvelous job of crafting the story in terms of the seasons. (Something I had to focus on, of course!) The themes of letting go and dying dreams correspond with the leaves falling from the trees and the cold winter weather setting in. And yet there is hope as the hero and heroine learn how to face those seasons and find the precious truths hidden beneath the piles of leaves. With an intriguing cast of characters and the right mix of the familiar/realistic and the exciting/imaginative, as well as a delightful dose of humor, Made to Last is a memorable romance story. Tagg's writing resonated with me, and I can't wait for her next book, Here to Stay! Cover Reveal for My Sophomore Novel!!! Is it already October 16th?? Huzzah! I'm getting long-winded today, just to warn you... I'm sharing a note about why I'm publishing a prequel after the sequel, the story behind my new cover, some places where you can learn more about the book, a little themed giveaway, and links to blogs participating in the cover reveal. Thank you for taking the time to check this out! I confess that "sophomore novel" isn't a completely accurate phrase... While Forget Me Not is the second book I plan to self-publish, it's actually the first novel I ever completed, and it covers events that happen before the things that happen in my debut novel (Bleeding Heart). Why on earth did I publish Bleeding Heart before Forget Me Not, then?? Good question! It was mainly a matter of timing and seasons. (Of course!) I finished my first draft of Forget Me Not my second year of college. (Do some of you recall that first glimpse I gave you in 2011? How time does fly!) At that time, I felt ready to take the publishing world by storm. Query letters? I could tackle 'em! Getting feedback? I had some awesome connections who were willing to help me out. I figured I was ready to share my work with the world. I got some really helpful feedback from Elizabeth Ludwig, who also ended up being my editor for Bleeding Heart. While she and others encouraged me, issues were brought to light that I just wasn't ready to face. Basically, I wasn't in the right frame of mind to edit. I was thinking: "But look at my baby! She's beautiful just the way she is. I mean, can't you see all of the heart I poured into her? All of the years of effort? She doesn't need to change!" I hit a wall. So I turned my heart and attention to writing a sequel. And thus, Bleeding Heart was born. Two years later, I finished Bleeding Heart, in a completely different season and at a completely different place than where I had been two years earlier with Forget Me Not. Does that mean Bleeding Heart was perfect? Not hardly! But after hiring Elizabeth and then Rachelle Rea (as my proofreader), I was able to polish the story and make it better. Doesn't mean I won't look back someday and think, "Oh, my writing style has matured a lot since then!" But I believe the people God allowed me to meet, the things I had learned up to that point, and where the story itself was - all of those things felt right and made me feel like Bleeding Heart was ready to blossom. Now Bleeding Heart is out there in the world, whatever comes of it. And I think perhaps Forget Me Not is getting ready to blossom, too. The two years' worth of distance has certainly given me a different perspective - oh my, does my baby need some help! But I still love her, and I think I'm finally at a place where I can give her the care and pruning she needs to grow. I've been doing a bit of research lately, and I'm thinking things are starting to come together in a way that will make my story tighter, while still adding depth to the characterization. (Be sure to check out the Pinterest board if you want to see some of the tidbits I've found regarding setting ideas, etc.) While I'm currently juggling editing and publicity projects for clients, I still hope to fit in time to edit Forget Me Not, get it to my copyeditor/proofreader, and still get it out to reviewers in time for a January release and blog tour. We'll see what happens! I started a secret board for Forget Me Not cover ideas not long after Bleeding Heart's cover was revealed. (I think? I don't know - it was sometime several months ago, LOL.) 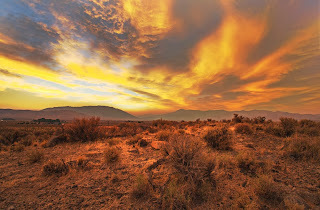 I pinned a couple of Virginia City (Nevada) pics, a couple of brunette models I thought might work for my heroine (Elizabeth), and a couple of forget-me-not images. I figured we would use a combination of three images like we had for Bleeding Heart - which ended up being the case, but a little differently than I had originally pictured! Anyway, so I had a few pics up, but they just kind of sat there for a while since I was busy with Bleeding Heart marketing and projects for clients, and Lena had her own things going on. (Like preparing for her October release - be sure to check out the page for her upcoming blog tour!) Then one day, before either of us had planned on working on the cover, I just decided to pin a couple more pics that I had come across that fit my heroine and hero really well. I figured I'd pin them there for reference (and hey, they're awesome to look at!). Well, let me tell you - don't start sharing pictures with cover designers unless you and he or she are ready to be distracted! With Bleeding Heart, we had a tough time picking just the right model to fit my heroine. So I was a little more involved in picking out images for that design than I was for Forget Me Not. The model Lena picked for my latest cover was one I didn't really think I'd like, at first. For one, the original image had a lot of...*ahem*...cleavage. The girl was kneeling on a wooden floor near a red velvet couch, and her hair looked messy. Basically, I had a hard time picturing her on my cover. I told Lena I liked the mood of the picture, but I wasn't totally sold. OK, this is why Lena is an awesome cover designer! She could visualize something epic with a model I was skeptical about. Her first mockup had this background all in blue, which totally caught my eye. But I love how she found the perfect placement for the model, a great color scheme to set the tone, and the right fixes to make the model fit my heroine (a reddish-brown tint to her hair - with a sweet hairstyle - and no cleavage!). Once Lena found the right bouquet and tweaked the colors, we were golden. Want to see the second cover she's given me? What I Love: The model's expression, innocent and hesitant. Her hair, which looks to be moving in a wind across the desert, with a rich color that stands out in the light. Her dress, which I absolutely love with its sheer and lacy shawl and the little flower pattern on the hem. The bouquet of forget-me-nots that fits so nicely in her grip and fits so well with a piece of her past (as well as the theme of the story). The clouds in the distance that suggest some danger and darker emotions. The bright and dry desert ground behind her, showing one of the main settings (in Nevada) and suggesting a coming dry spell for the heroine. The hills in the background that also emphasize the setting, while matching the cover of Bleeding Heart so well - hinting at the ups and downs my characters face. The title font that draws attention to the forget-me-nots while hinting at the genre. And the whole concept - the way the colors and feelings contrast and yet work so well together to give a glimpse at the story. 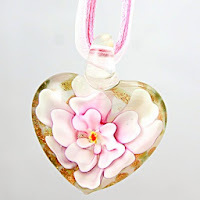 Want to learn more about Forget Me Not? 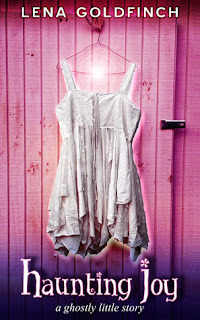 The book has a home in the blogosphere at www.forgetmenotnovel.blogspot.com! You can find a book description, author bio, soundtrack beginnings, links, and blog buttons there now - and I'll keep the site updated with the latest news and info. Hope you'll enjoy visiting! Huge thanks to Anne Elisabeth Stengl, whose book blogs inspired me and served as great models as I put together my own. Plus, Anne Elisabeth was sweet enough to make some blog buttons for me! Do feel free to check out the Buttons page on the book's site and take a button or two if you'd like to help me spread the word! 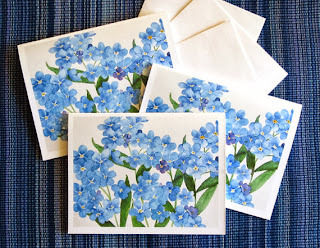 To celebrate today's announcement, and to give a present along with the cover candy, I'm giving away a set of three forget-me-not note cards from Carol Sapp Watercolors. Aren't they lovely? Just use the form below to enter! Please note that this giveaway is for U.S. residents only. Feel free to e-mail me if you have any questions about how to use the form! The winner will be announced on Monday, October 21st. Now seems like as good a time as any to clarify this, so here I go! 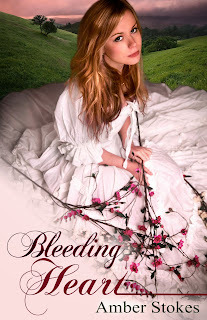 Yes, I purposely titled my books Bleeding Heart (singular) and Forget Me Not (without hyphens). I wanted Bleeding Heart to be singular to match the singular nature of the other titles in the series. I also felt like it indicated the shared journey the five main characters were on (in a sense), as well as the emphasis on Sally's character arc, in particular. And I wanted Forget Me Not to be focused on the phrase of the flower name. In other words, the title connects with the flower, but it is more a phrase than a name - like someone saying, "please, forget me not" vs. the way the flower name is written (forget-me-not). I hope that makes sense! I would love to hear your thoughts on the new cover! Hope you have a wonderful Wednesday! I apologize for being scarce on the blog lately - things have been a little crazy these past few weeks! But I do have some exciting things to share soon, including the cover reveal for Forget Me Not (my second novel, and the prequel to Bleeding Heart) on October 16th, the blog tour for Haunting Joy by Lena Goldfinch at the end of the month, the blog tour for Love's Refuge by Sandra Leesmith in November, and hopefully another blog tour or two in December before the blog tour for Forget Me Not in January. Phew! I'm definitely keeping busy with editing and publicity projects. It's a little stressful, to be honest, but I'm blessed to have the work and the experience! I filled in the following blanks with titles of books I've read so far this year. Have you read any of these books? How would you fill in the blanks? Do feel free to share! A Spooky Special-Edition Cover Reveal! 1. It's the first in a series of "haunting" novellas. So be on the lookout during the blog tour and at the end of Haunting Joy for more info on book 2! 2. As just mentioned, there's going to be a blog tour! Keep your eye on the blog tour page to stay up-to-date on the latest news, and mark your calendars for October 22-31. There will be reviews and giveaways and lots of Halloween fun you won't want to miss! ...there's also a special edition cover that will only be available in paperback format. And that's what today's cover reveal is all about (besides building excitement for the book's release and the blog tour, of course!). Are you ready for this?? What I Love: The old-fashioned, classic "thriller" look to it - like a slightly scary black-and-white movie. The simplicity of the design highlighted by the spooky glow. The ghostly light hovering above the dress. The hint of light peeking through the door (makes you want to know the secrets in the story!). The font of the title that adds a bit of girlish whimsy befitting the heroine. All in all, a fun little twist on the original purple and pink cover (which is also quite pretty and eye-catching in its own right). It all starts one ordinary afternoon, as seventeen-year-old Joy tries on some thrift-store clothes her grandmother gave her. The little white dress fits perfectly. Trouble is, now it won’t leave her alone. Soon Joy is swept up in an extraordinary journey to help a ghost complete some unfinished business. If only that didn’t involve Joy driving through dangerous intersections...or calling up her high-school crush, Nick...or getting stuck at a cemetery after dark. So, what do you think? Does this look like a read you'd like to treat yourself to this month?